F32T8 Chroma 50 light bulbs are a suitable replacement for any T8 fluorescent lamp with poor color properties. Most people find it's easier to work and function under the natural lighting effect of full spectrum lights. 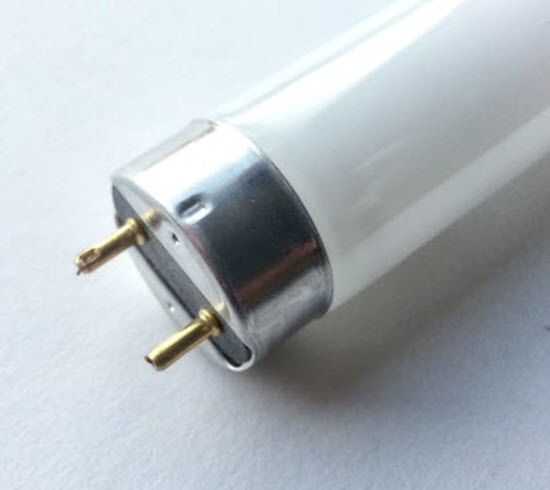 These will work anywhere you might use a standard 32 watt T8 lamp such as a cool white. Simply replace it to get better color, visual enhancement and a cleaner, brighter appearance to your home or office. Unlike other linear fluorescent lamps with incorrect color temperatures, this light has been used many times for color matching, making sure that colors match up correctly in places like printing, dental offices and retail. It can save you money in your process by making sure that all the colors are correct. It has a 92 CRI rating which means color rendering index and it's one of the highest that you can get in the industry. The excellent color of the 5000K is used to simulate noontime daylight which is the optimal color the way our eyes use light. Some people call this full spectrum lighting or natural lighting and that's simply a way to describe the effect of outdoor lighting. Of course the chroma 50 will also be an excellent choice for your regular office. It will help reduce eyestrain and create better visual contrast with documents that you are looking at. Over the course of the day it really is much easier on your eyes and that could result in greater productivity over fewer desirable light sources. This is a T8 lamp and used in light fixtures that have an electronic ballast. - 92 CRI color rendering index. - Light output 2200 lumens. - Works on T8 electronic ballasts. At BuyLightFixtures.com, we want to provide you with the highest quality color correct fluorescent bulbs that are going to last for a long time and take care of your lighting replacement needs. The 40-watt T12 fluorescent tubes are the older style of fluorescents that were used for general lighting and still are today in many light fixtures. Although many have been replaced with F32T8 and lower watt LED, there’s still a lot of you who have these and need these for a fluorescent replacement bulb. Most of the time this fluorescent light bulb cool white was the most popular for offices and commercial lighting everywhere. They were also used in everybody’s garage workshop or basement, it was so pervasive. Now we have these as a consumable item that you can still buy or consider replacing something more energy-efficient and better color rendering fluorescents. The operation of T12 and T8 lamps. T12 lamps operate on a magnetic ballast most of the time, although on a few occasions people and converted some of their light fixtures to an electronic ballast that will utilize this light. It’s very hard to get any more light fixtures that are made for this type of bulb, but we still have a few of those. Most people are converted to the T8’s that operate on an electronic ballast and that’s been the natural replacement. The ballast in this operation is much heavier than the electronic ballasts because of all the copper windings on the inside. It’s also a rapid start ballast and starting operation, not an instant start. Sometimes you’ll see this a little slow to light or it’ll flicker a little bit before it goes completely on. That was the nature of this type of lamp and that’s why a lot of people are replacing it because of its flickering, poor color rendition and poor energy consumption. But for many people, it might not be in the budget to replace them all at this time for something more efficient and if that’s the case we have plenty in stock for you. There’s no talking about fluorescent light bulbs without talking about color temperature. The most common are cool white, warm white and daylight but we also have these higher color rendering in both T12 and T8 lamps. Typically these are anywhere from 5000K to 7500K light color but there are other light colors such as the more particular Kelvin temperature versions which are also available. Not only are these colors available, but more color correct type of fluorescents are still used in many types of applications and that includes the Chroma 50 and Chroma 75 for people who need a daylight color that has high color rendering. Once again, for people that are moving into something more energy-efficient we do have T8 lamps with the same color properties and improvements. Typically, you won’t find them in your local store anymore, but we have them ready for shipping every day. Saving money and update your lighting. With the advent of more energy-efficient light sources such as LED tube lights, you’re seeing some of these replaced now with T8 LED tubes. It’s a good choice if you want to save more energy and possibly qualify for a number of different rebate programs that electrical utilities have. LED lights will give you the same amount of light for less wattage and so this is where you’ll get the best possible savings. Some people don’t just change the tubes, they will go for a whole new light fixture if some of the incentives are really good or their lighting system is particularly old. If that’s the case we have a complete line of lighting fixtures in LED and for some situations with the payback being so good, it might make sense to go to a completely new fixture instead of just retrofitting to an LED bulb. If you want to know how much you’ll save on going to an LED T8 light bulb, we have a free download on the left-hand column of our website that is an energy savings calculator in an Excel spreadsheet format. It will give you all the information that you need to do a simple comparison for what you have now and what you may be thinking about going to as far as in more efficient lighting solution. If you’re unsure about what you need, just give us a call or email us any information or questions that you may have. We have a lot of experience with all types of retrofits in new construction situations. We know how to get the best lighting for the least possible amount of energy consumed. And it’s not just about saving energy, it’s also about getting the best possible illumination for your interior space. We have plenty of F40T12 light bulbs in stock for almost anything you may need them for. We can get them to you quickly and we pack them up very well so they get there in one piece, no problem. We had good warranties on the product and if you’re looking for a larger quantity, make sure to get a hold of us for a special quote. For multiple cases, we can help you with the pricing or if you’re ordering these for other locations, we can send them there as well. There’s never been a better time to maintain your lighting system with either fluorescent color correct light bulbs or its new T8 LED alternative.